Got the white sundresses and seersucker suits back in the closet yet? Yes, summer is over, at least symbolically here in the States, and with any luck our attention is now focused on a return to normalcy. Of course, being of a certain age I am ever reminded of today’s selection, written and performed by a ’60s Tin Pan Alley legend whose star rose infinitely higher as a ’70s singer-songwriter. King’s initial response, “Oh Neil”, failed to chart, but with the help of Goffin she tried again with “Will You Love Me Tomorrow” which eventually became the first-ever Billboard Number One song by an all girl group when the Shirelles released it in 1960. By then King and Goffin were married and working as a songwriting team at the Brill Building, cranking out such standards as: “Take Good Care of My Baby”, “One Fine Day” and “Up on the Roof”. Although she served as a backup vocal on Little Eva’s “The Loco-Motion” (which she co-wrote) in 1962, it would be nearly a decade before King, who suffered from stage fright had any further success as a performer. Meanwhile she and Goffin extended their successful Brill Building streak (e.g. “You Make Me Feel”, “I’m into Something Good”, “Pleasant Valley Sunday”) before the marriage (and partnership) ended in divorce and, in 1968, King headed to L.A. to serve as songwriter for Strawberry Alarm Clock among other assignments. Her new residence, of course, was in Laurel Canyon. As you may remember, by the late 1960s Laurel Canyon had become a haven for such newly trending folk-rock singer-songwriters as Joni Mitchell, David Crosby (along with Stills, Nash & Young), Glenn Frey (and the Eagles) and Jackson Browne. But it was, James Taylor, an old friend who she’d first met in New York, who encouraged King to overcome her inhibitions and reinvent herself as a full-blown singer-songwriter by releasing a solo album in 1970. Although it received positive reviews, “Writer” was initially a commercial flop and it wasn’t until the following year that King finally returned to the Top 40 charts with her second effort as a singer-songwriter. Actually “return” is an understatement. 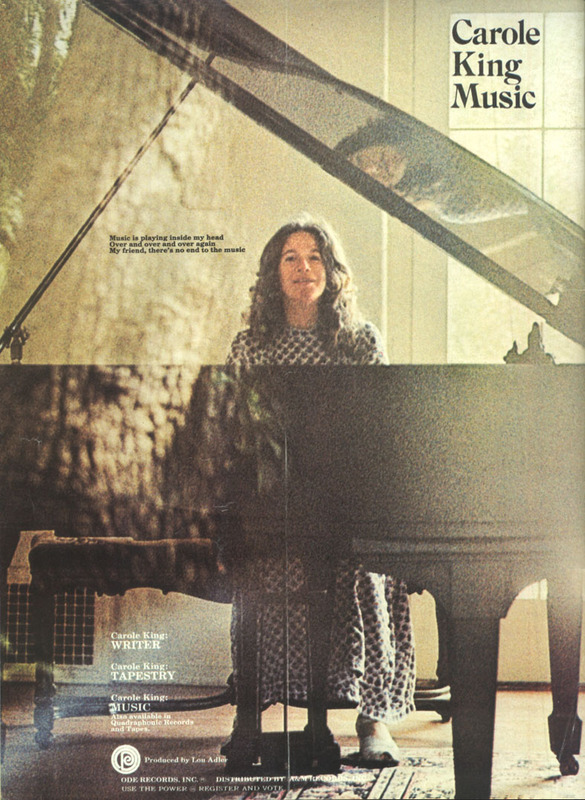 “Obliterated” is a more suitable term because “Tapestry” hit the airwaves like a howitzer and Carole King was suddenly an iconic 1970s singer-songwriting superstar. “Tapestry” owned the Number One Billboard Album spot for an unprecedented 15 consecutive weeks, the most ever by a female solo artist, and it took over 40 years (this year to be exact) before the work of another female artist finally surpassed its total number of weeks at the top, albeit non-consecutively. That album, Adele’s “21” still has a long way to go, however, before ousting “Tapestry” from its standing as the longest charting album by a female solo artist…with over 300 weeks logged between 1971 and 2011. Certified Gold only days after its release later that year and reflecting the mood of its predecesor, King’s third album, “Music” (officially “Carole King: Music”) immediately joined “Tapestry” as a Top Ten Album on the Billboard Charts, where it would sit at Number One for three consecutive weeks in 1972, while remaining on the charts for over 40 more. Yes summer is over but, so long as the music keeps playing, perhaps a little seasonal reinvention is a very good thing indeed. And won’t let the world get me down.